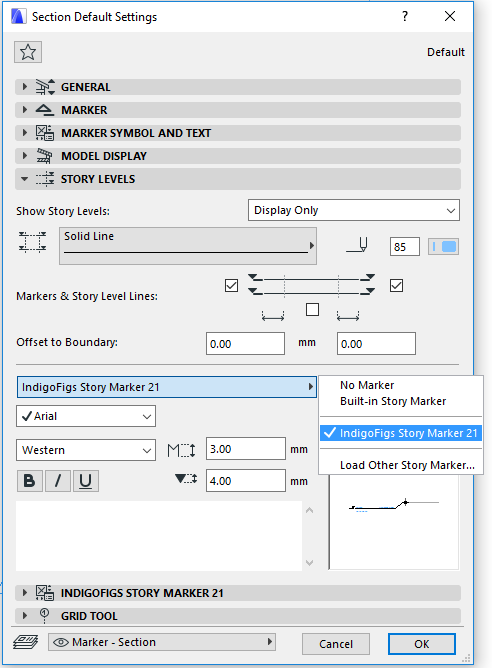 “IndigoFigs Story Marker” is a view-base story marker. It allows you to turn on/off each story’s marker without affecting other markers in different Elevations/Sections. Please see the key features below. Display Story Name (with or without Story ID), 2 Story Elevations with separate Reference Levels. Additional Stories / Levels for extra levels needed to display, without having to add actual project stories. Markers on the left and right side can be move(offset) individually for each story, or using “Batch Offset Distance” tab to offset multiple stories (base on elevation) at the same time. All of the contents, except Story IDs, come with “Custom Overwrite” option, which allows overwriting individual story, not just “Overwrite All”, with additional option to use “Remark Pen”. Story Elevations with Optional Secondary Dimension Format that both can be link to settings in Option > Project Preferences > Dimension or using “Custom” within it’s own object’s setting dialog. “Fractions in Small Type” option in “Custom Dimension Format” tab also available. Each Story Name, ID, Elevation has separate text settings (Font, Size, Style) with optional “Uniform Text”. Content’s positions are adjustable (affects all stories). Supports up to 500 project stories. From version 2.00, supports project that doesn’t have stories’ ID less than -99 and more than 400. For more options, please see Graphisoft’s documents here. Double click “Section Tool” or “Elevation Tool” > “Story Levels” tab then select “IndigoFigs Story Marker” as an active story marker. (10 Sep. 2018 – for ArchiCad 22) Backward Migration Script added. (20 Nov. 2017) “Custom Overwrite” option will automatically fill the blank field with Project Story Name and Additional Level Name (if set in “Additional Levels Settings …” tab). This is useful when only a minor detail needs to be edited, such as, from “First Floor Plan” to “First Floor Plan (revision 1)” or a special character needs to be issued( \n = new line, \t = tab ). 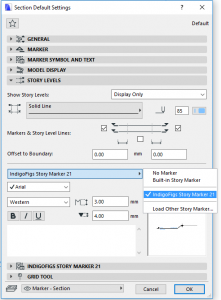 (23 Nov. 2017) Textblock Width and Text Alignments for Story Elevation 1 and Story Elevation 2 are disabled. Their values will be automatically calculated instead. (2 Feb. 2019) Parameters were offset when inserting new stories below the lowest level. Fixed. (10 Sep. 2018) Story Level Lines are not displayed correctly. Fixed. (31 Jul. 2018) Width Factor and Spacing Factor for Story Elevation Text 2 are not displayed correctly. Fixed. (3 Jul. 2018) Display Marker Options “Alternate Left/Right” and “Alternate Right/Left” are not working correctly when there is only one active level on either side. Fixed. (23 Nov. 2017) “Mirror Text Alignment” option for Story Name is not working correctly. Fixed. (20 Nov. 2017) Marker only works for project with 50 project stories, not 500. Fixed.